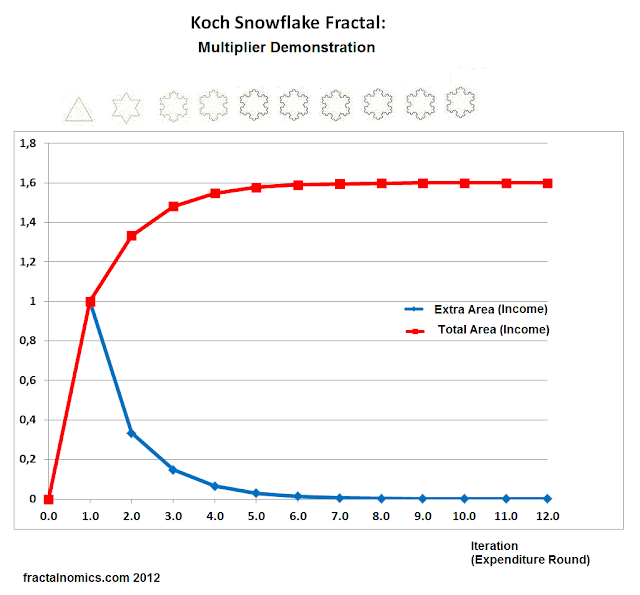 Development, and growth of the fractal demonstrates the (money and Keynesian) Multiplier. The (Keynesian) Multiplier shows how an initial injection of expenditure into an economic system goes on to create more income. This is because added expenditure – in itself – sets off additional rounds of expenditure with each and every hand or round this income passes. In the diagram below: income is represented by the area of each and every triangle, and the rounds of spending by every iteration of the rule. The initial injection (iteration 1) is represented by the first triangle – which has an arbitrary area of 1. The next round adds 3 extra triangles, increasing the total area of the snowflake. This (principle) process continues until the changes in area of the triangle – after each iteration – changes the total area of the snowflake no more. In the diagram above the total area reaches 1.6, at around the 12th iteration. The Keynesian Multiplier equals: change in income divided by change in injection. 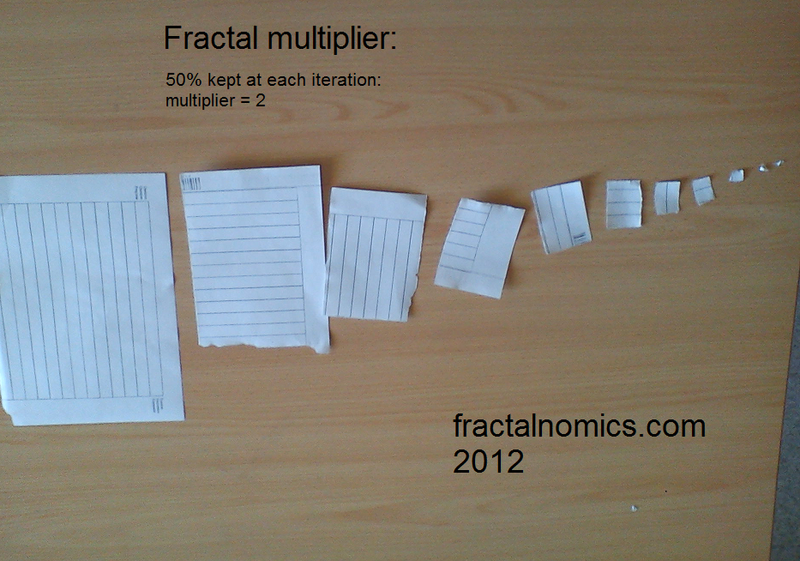 The Fractal Multiplier thus equals: change in total area divided by change in initial area. 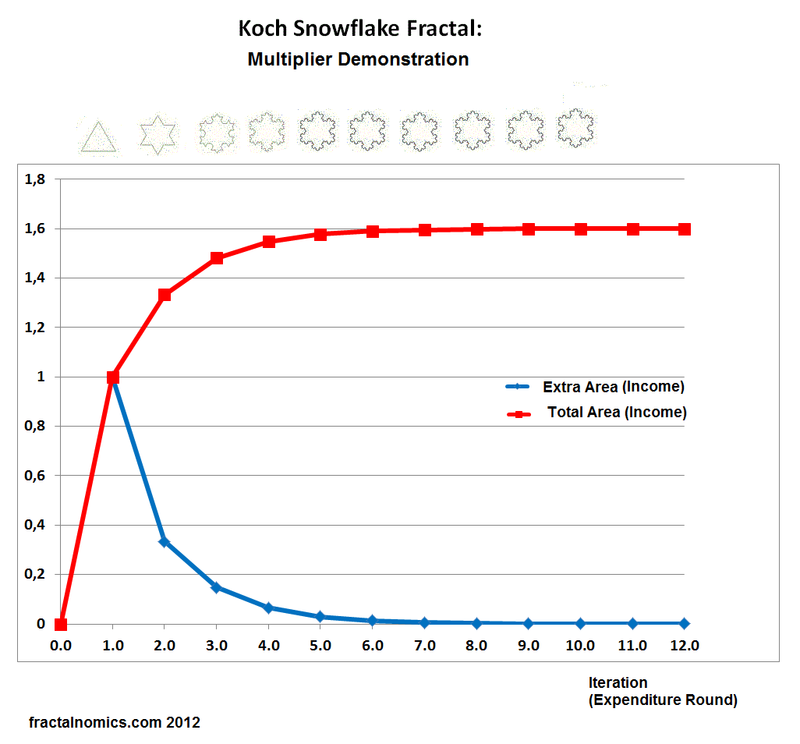 The (Koch Snowflake) fractal multiplier is equal to 1.6 (1.6 divided 1). From this it can be inferred or deduced – due to its principle similarity – that the multiplier effect is a universal fractal phenomena, and that the Keynesian observation stands as further evidence that fractals are our reality – that reality is best understood by understanding fractal geometry. (In class) the multiplier can be demonstrated by having the students pass on (for example) 50% of a piece of sheet paper (see the below photo) careful to save the other 50%. The 1st and largest half represents the initial injection, and the 11th and smallest half (the last the paper can be divided). The iterations multiply a factor of 2 times of the 1st half. Your ideas are at least very interesting.